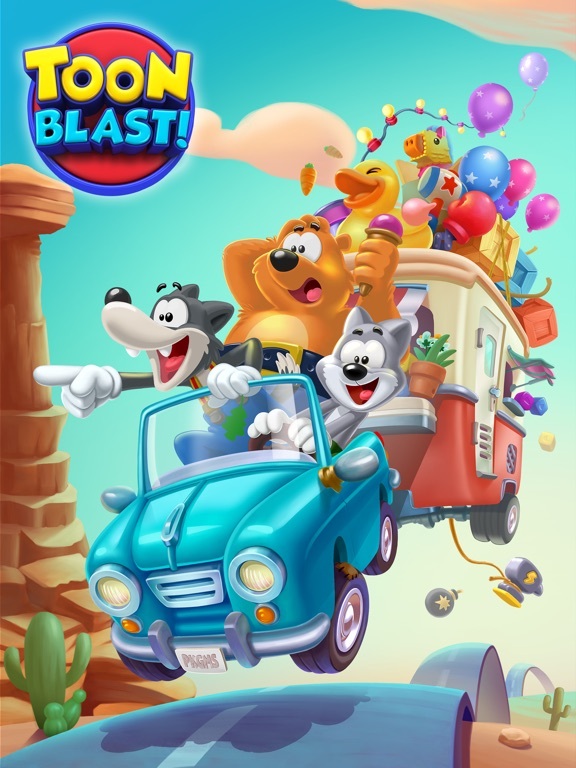 Toon Blast is a fun game with its Looney Toon-style characters, colorful graphics and action. Using the classic anvil, mallet and boxing glove 🥊 tools assist greatly in wins. Hopefully I can continue to win without the game becoming too expensive. I love this game. I played for well over a year every single day. I made it to the last level a couple of times and had to wait for updates to play more. I’m currently on level 2,374. BUT, I absolutely refuse to support any of these games that are doing this false advertising that is plaguing the App Store right now. I’ve stuck with this game longer than any I think. Some levels are so hard you think you will never get passed. Then finally, like magic it happens. Love the weekend team competition. I had over 85 lives saved..All have disappeared..I can see them while playing on my IPad but not on my phone.. ..Where are they?!! The game is fun no doubt. If you spend money, you can win easier whether or not you use the tools. Don’t spend money, and you end up on a level FOREVER. another micro transaction game. forces you to keep paying in order to keep playing. App was not working and I bought some lives.... didn’t get. Hope I get I refund. 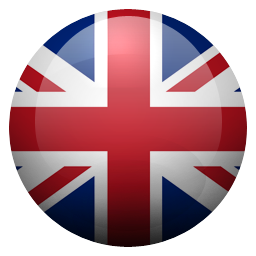 The game is not only stable, but it has an enjoyable, positive, team aspect that enhances the enjoyment. It’s a free game and effectively ad-free. What’s not to like? I have been at masters level for a while now and have enjoyed helping others to break through the most difficult levels. This game is a piece of garbage. It is old, old technology and waste of money and time. AVOID! Love this game. But I wish we could use the bombs, arrows and globes in the game not just in the beginning. And I wish we could get more coins faster without paying. Also I have lost a lot of turns before this last update. Overall it is a pretty good game. It is a very colorful fun game, I think, I could be wrong but it seems to be more for a younger generation but Either way enjoy it very much, it is my first time playing it and I’m already hooked, I’m having a blast. Congratulations it is a well designed game. 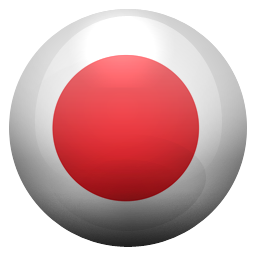 I love this app sooooo good get it!!!! There are so many bad reviews that I just had to give my review. I really enjoy this game. It’s very satisfying, fun and challenging at times. Which is what a game is. I love that it doesn’t stress me out or frustrates me like candy crush. It’s one of those when I’m bored and need a game to play type. A tad bit satisfying with certain rounds, of course. But over all I LOVE this game. It’s a true game. This game is great but it won’t allow me to play the new levels that launched today. It keeps telling me to update and brings me to the App Store when I have already updated. This is very frustrating. I’ve enjoyed playing this game for a while now... However, I think you should give away more free lives and bigger rewards for leveling up etc. This is a fun game to pass the time. The levels get progressively more challenging until you hit the challenger levels. Now it’s just some simple entertainment to pass the time. 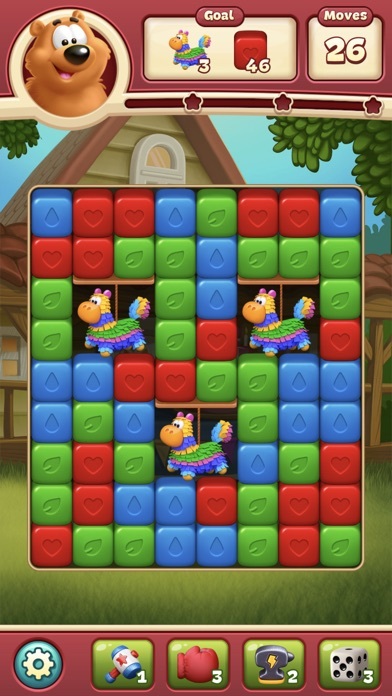 If you like puzzles like Tetris and Candy Crush then you’ll probably like this. I’ve occasionally purchased extra lives however I figured out that the lives refresh pretty quickly (a new life about every 20 mins) so I don’t spend my money any more. 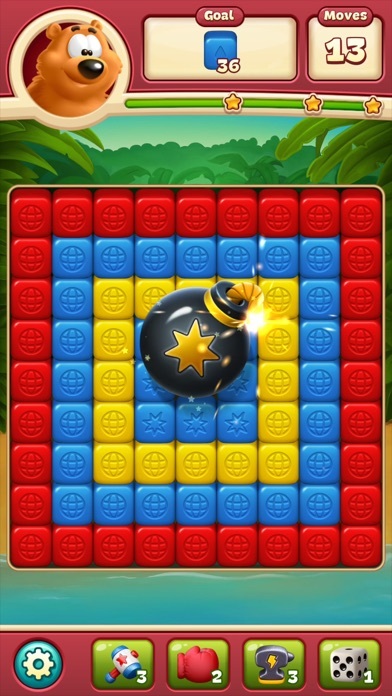 This game is fun, just like Toy Blast! It is almost a copy of Toy Blast. When I started playing I didn’t want to stop. However I found out you cannot go back and re-play levels. That is so dumb, so if I want a better score, I can’t , there is no going back. To me that was very disappointing, at least in Toy Blast I can play a level as much as I want. We only have 25 people on our team and if you win first place for the team tournament you get 50,000 coins divide to each team member so we should receive 2000 but we only get 1000 coins. There’s only 25 people and getting first is an accomplishment for such a small team. Please fix this and give us our deserving coins thanks! I love this game and find it addictive as all getup, but I’m not willing to pay for bonuses. If you had ads, I’d gladly watch for free coins. I see people complain about spending too much money to pass or the prizes slitting among players who don’t play. Well I haven’t spent any money nd still able to pass levels. I’m in the trophy room. As for teammates, YOU have to look for a active team! Don’t like your team then change teams! I’ve changed teams 4 times! And finally landed with a very helpful team. Seriously can’t get enough of this game! When you go to hit play again and your out of lives. It automatically takes the coins you collect to get 5 lives. It should have an ok or are you sure button! Get on a great team and Help and play. Though I did, do not buy chances on this game, it is a rip-off. 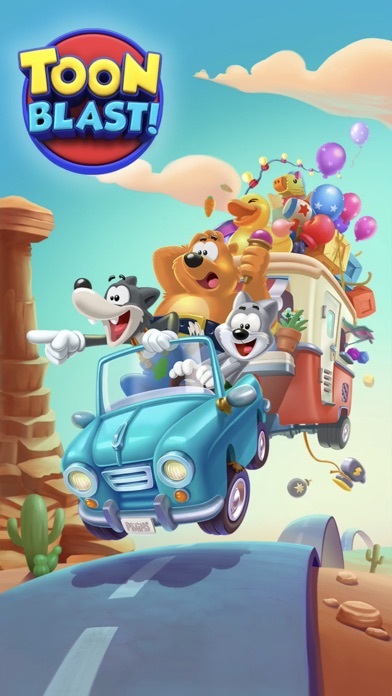 I thank you should get this game because it is hard challenging and also fun important role is to have fun I recommend this game for ages four and up because it’s very fun so if you have a toon and a blast and you liked this review then this is the game for you. Now go and play this game. I do enjoy this game. It gets a little frustrating when you can't get past a level due to bad RNG, but still fun. The only thing I wish we could do is as a leader I would love to be able to add assistant leaders to help manage a team. This works real well on a I phone 7 ! Some levels are just impossible to beat because there are just not enough moves. Level 136 is really impossible to beat, despite my multiple tries I cannot beat it. I am thinking about deleting the app, but I kind of don’t wanna give up. Am I the only person that feels this way? This game is fun at first, and, yes, very addictive. However, as you progress, you’re not going to get through any levels very quickly. It teases, and tries to get you to spend lots of money. I do not. I have however purchased one piggy bank. But, I’m not dropping hundreds of dollars on a mobile game, that’s insane. It will eventually be nice and let you through levels. And, the challenges are ridiculous. You’ll never get anywhere on them unless you spend lots of money, which defeats the purpose of the challenge. Folks that win the challenges either have to be spending lots of money, or using cheats (if those really exist), OR it’s the developer running the stars up hoping people will spend money to “try” to win. (On the individual challenge So) I don’t believe that anyone can get 90+ stars in a matter of minutes after a challenge starts. At least not honestly. Even spending real money, I don’t see it. Team challenges, however, are possible to complete, IF a lot of people on the team play and contribute. Most folks on the teams seem to no longer play, I e found. It’s okay to kill a little time though. Mindless playing to relax. Toon Bast is a lot of fun at first with rewards for finishing every 10th level and gaining every 20th star, but the more advanced one progresses in the game, the more it feels like the house always wins. Coin rewards initially start out big, but gradually get smaller and smaller. If you only need a few more moves to clear a level, but the awarded number of moves runs out, you can buy 5 more for 100 coins. No problem early on, but as those rewards start to dwindle, you’ll need to fork over some real cash for some in-game coinage. Considering the game controls how “lucky” you are to collect similarly colored blocks (the method to clear a level), it appears the designers have built in unfavorable odds that cater to the impatient player who is willing to spend actual money for some in-app coins and power ups. Power ups are another commodity that are randomly awarded and, in some cases, needed to finish a level, but again, if you want specific power ups, you can’t buy them with your fake coins, you’ll need to make an in-app purchase. Bottom line: fun to play, but either be patient or have money to burn. It is possible to play through this game without spending a cent on it. This is what I have done and I have made it past stage 850 out of the 1100 total stages. This game is a way to cash out on all the pay to play games, but it isn’t that bad in my opinion. Have some patience and wait for your lives to regenerate then try again. However the stages aren’t really fun after a while. The gimmicks used in different stages are eventually recycled but have a different name and design to it, I.e. make matches next to hats to get carrots, by stage 800 or so they introduce birdhouses where you have to make matches next to them to get birds, same thing just different look to it. This game is fun at first, like they all are, after a while if you want something to do for 5 minutes you can try burning your lives on the same stage for days because there’s quite a bit of luck involved. You can also get on a roll and clear 10+ stages in one run. I have played this game for a few months and have cleared more than 75% of the stages without spending anything in this game, it’s not worth it to me. At this point it’s something to kill a bit of time. I agree with the last reviewer in that the game is set up for you to fail, lest you spend your resources to move forward. I add, it is fraught with glitches, which may actually be intentional attempts to frustrate you into purchasing. My most recent go at it on a level, suddenly ended with 17 moves left. I’ve had coins “disappear” without my spending as well. When addressed with customer service I received the ol’ deny, deny, deny response, further stating I had made purchases I know I had not. To the player I second the warning, beware as you play. They are not on your side and it was not just designed for your entertainment. The bottom line is as it always is, to make a profit. Know this as you play and read the reviews. The truth is there in print for you to see! Update: They’ve begun to make certain “cheaper” packages unavailable to further force your hand into purchasing more. Also be on the lookout for when your star chest doesn’t refill your lives, because that happens from time to time as well. Upon informing customer service they said “the update does not guarantee free lives” so they admit they punish a player instead of reward them. The app developer is a joke. Terrible system. This review is from a longtime and current player ..... with that being said, I feel like there are a few issues that should be fixed to accommodate players like myself who have a vested interest in continuing the game. There should be an option to remove players who have no activity after a period of time. In my teams situation the team leader doesn’t play. Now we all know that there could be a number of reasons why, but the fact stands that the rest of us suffer. There must be a better solution than disbanding the group we have because we can’t make changes to the team. As content creator you must take into consideration that those who have been active in these groups have been dealing with the same people for a couple of months/years. So essentially you all have created a game focusing on “Teamwork”, more recently with emphasis on The team tournaments and the team chest. Yet, you refuse to come up with a proper solution to the issue with inactive teammates. Something better than moving the team to different groups like adding moderators or other people in the group who can remove the inactive. I just want to see a solution rather than ignoring it. I have been playing this game since last summer and am addicted to it. I even had to load it to my 4 year old grandson's iPad too. He especially love the bombs and the other boosters that create an explosion. In reading the reviews I have to say I agree with them. There is far too much time to wait for full lives and that should be addressed. 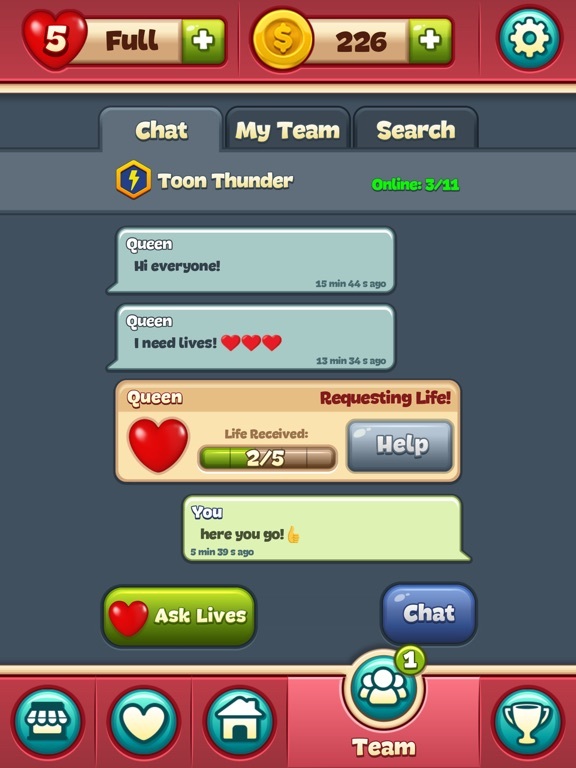 I enjoyed the daily opportunity to get more lives, coins, boosters, etc. That was a nice addition unless it only appears once you reach a certain level...not sure if everyone gets it since I'm on level 604. 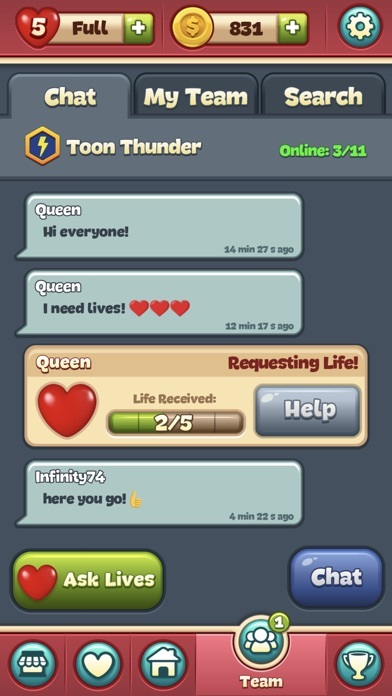 I wish more of my fellow team would request lives so we could help each other out. Out of the 50 on my team there is only about 6 of us that actually participate. Would be nice if there could be some kind of a reminder to the others that this is available. Would like to see other opportunities to obtain more coins. For those of us who won't spend the money to purchase coins and boosters this would keep us playing more. Again…love this game!! Why all this negative reviews? I don’t understand why everyone is giving bad reviews. I love this game yes sometimes it’s hard to pass a level but what game isn’t hard when you level up? Maybe you need to play kiddies game instead. It takes some time to level up, do you expect to pass 100 levels in one night? NO! Just keep playing until you figure out a strategy. YOU DO NOT NEED TO SPEND MONEY. Spending money is optional. I’m on level 1180 and I haven’t spent a cent. Weekly chests are good at helping you get more coins and powerups. I’m giving 4 stars because I wish the time on getting life’s was shorter or easier to get. Other than that I have no complains. Join a team that will help you achieve in your progress. I love my team that I created they are the best at helping at opening up the chest and quickly getting you your life’s. My team loves to encourage and motivate you when you’re stuck. But I still wish the time should be shorter or at least give a different way of getting your lives quicker. I want to start by saying that this is a good game. That said, this has some features that I cannot stand. First off, the life limit is stupid. I just have a fundamental objection with being limited to a number of lives, and having a timer to regain them. Which brings me to my next problem. I cannot stand pay to play features. If you want to make money, then sell the game for a couple bucks and make other things unlockable as you progress. And finally, as you progress in the game, I understand that it should become increasingly difficult. But in my experience, I’ve progressed to the point that each level is becoming almost impossible to pass unless the absolute series of miracles falls in the game to essentially clear the level. I’ve had this game a couple weeks and I am honestly experiencing burnout. It’s become difficult to the point that I don’t find it enjoyable let alone playable unless I start utilizing pay to play features. To that end, I am giving two stars. Well done game, unoriginal concept, and becomes unplayable much beyond level 150 unless you start shelling out money. I have been in a top team, but along with the others in that team I am frustrated with the de elopers of this game. Lately there have been too many challenges with impossible goals so that one is forced to spend money or take days to play the new levels. Some people on teams do not play for a number of reasons, even on a team of top players. I despise the dueling against top world teams and the ridiculous 6000 star chests with rewards not worthwhile for the effort. I feel pressured when on a team because I am an over achiever. I am thinking of playing with no team so I can determine whether to stay at all. New levels are too impossible to be fun, all while having a ridiculous 6000 star team chest. The cost of playing is absolutely ridiculous. Yet I did enjoy this game for a time until the developers got too greedy to force people to pay. There is no way to give and get lives without a team. Also, you cannot play this on Facebook or cinque platforms, unlike Toy Blast which is individual oriented. I have liked this game so far, but there isn’t really much depth into it if you think about it. There is the same thing in different levels. Crates, blocks, bombs, disco balls, rockets, bigger versions of bombs, etc. Those were only some of the things I could describe that is mainly in the game. One thing, the animals or mainly the mascots for the game just don’t fit. Honestly, Toy Blast thought of a better mascot and their mascot is a rocket, since it’s a toy in “Toy” Blast. But bears, a wolf, etc. aren’t “toony” unless they’re in cartoons. Another thing, don’t waste money on Toon Blast or Toy Blast, since after using the things you bought with your money you’re gonna want to buy more to win and then finally find out hours later that you’re bankrupt. I haven’t experienced this yet since I am just a child who doesn’t have a job. Of course children mostly can’t have a job. But of course, that is a possible scenario and it can happen. It’s like realistic fiction, because it probably hasn’t happened yet but it can. Have a good day everybody, and I hope this information has helped at least one of you reading this review. It may be similar to many other games before it, but this title's handful of unique dynamics (unique in my experience, anyway) and quality balancing (slow but steady difficulty curve, shortcuts for the inevitable unhappy circumstance, etc.) make it truly engaging, encouragingly light hearted, and unquestionably strategic! The tournaments and team elements are quite fun, also! Now, I say "can be" very fun, and not "is always" very fun for one reason: as the levels unfold, the starting boosters become more and more necessary for a consistent chance to win and therefore enjoyable gameplay. This doesn't lower my rating, however, as these booster items can be reliably invoked by a happily common event known as "crown rush", and can furthermore be purchased en masse with real money for complete control (not to mention their being given, in smaller quantities, as gifts in chests, daily rewards, etc.). Overall, I've been truly appreciative of this entertaining pastime! I came on here to right a positive review about this game, and I was surprised to see all the negative reviews! Yes, if you want to play this game non stop 24/7, you’ll need to spend money. But I’ve made it level 770 without spending a dime! Yes, it requires some patience to do that, but it’s probably for the best because if there wasn’t a life limit, I’d probably never stop playing! 😄 I love this game because it’s a great mix of strategy, luck, and just plain fun! 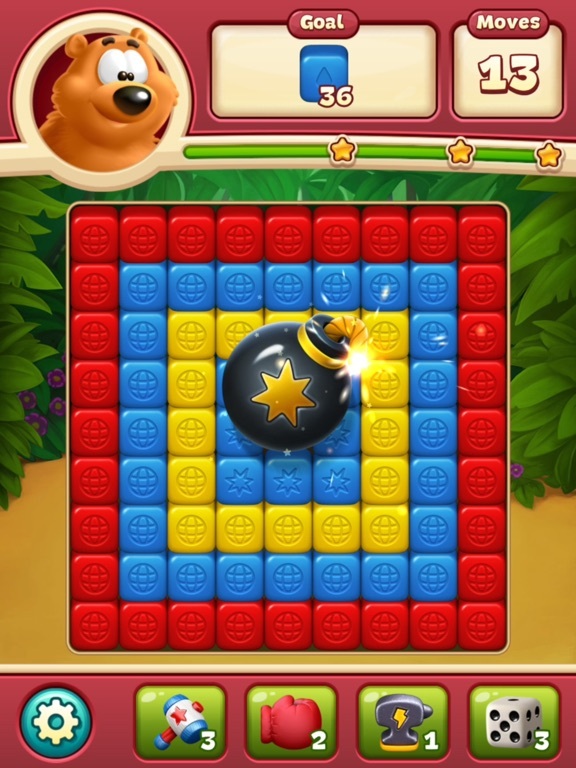 I started playing Candy Crush and Cookie Jam shortly after Toon Blast, and I hated them! 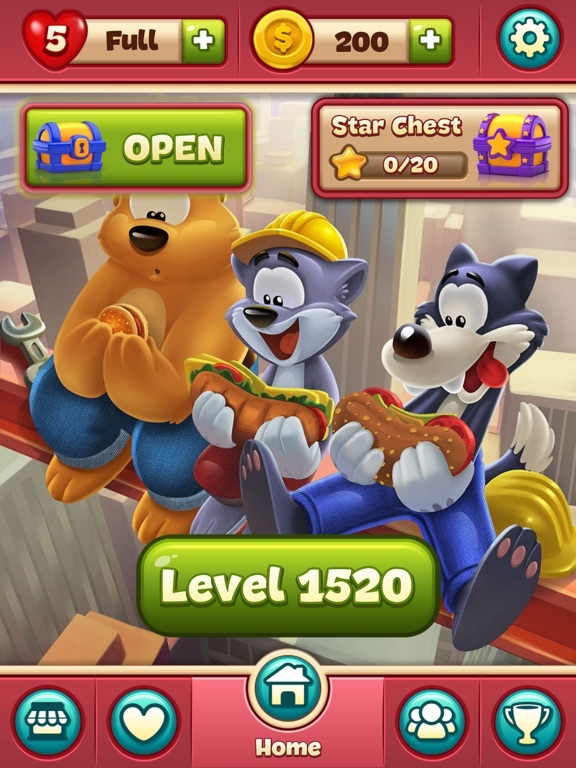 The longest I’ve ever been stuck on a level on Toon Blast is a day...with other games I’d be stuck for days on end, and it truly felt like I was going to have to spend money to get past them, which isn’t worth it to me. Another bonus to Toon Blast, NO ADS!! I absolutely love that! It’s great fun! Plus you can join teams (or make your own) and give each other extra lives! ... at some point, an update changed things. There is a Star Chest, that when you get 20 stars it’s available to unlock. At first, whenever you unlocked it, one of the prizes was always filling your hearts (life). So you could save opening that chest until you were out of turns, then open it to get 5 more. Guess they decided to change that, so now it never gives you lives and only provides some power-ups. The lives thing was a nice bonus, a shame they nixed it. Also, when starting levels with power-ups (from beating previous levels) they have changed the location of those power-ups to purposely be as far apart as possible.. it seemed more random before and occasionally they would line up next to one another. Small complaints, but they are obviously put in there to make things harder and hope people will buy lives. Hopefully no one spends any additional money in-game! The game is fun and challenging enough without these crappy tweaks. I love this game! I recommend you give this game a try. It is a very addicting puzzle game. It is similar in premise to others available, but in this game as you move up the Episodes, new challenges arise in order to clear a level. This mixes it up so you are not doing the same exact thing over and over for hundreds of levels. I am currently at level 880 and I have not bought any lives or boosters. I am part of a great team that gives lives very quickly. If you get in a team that does not give lives when you ask, join another one. The Toon Chest, Star Chest and the lives given by my teammates have allowed me to move up pretty quickly for free. The Crown Rush is also a plus when it is in play! And now there’s a Daily Bonus! Even better! I get stuck sometimes, but I get better with practice and eventually move up or use a booster that I have saved. I wanted to rate with zero stars, however it makes you check at least one in order to leave a review. Played in 2018... enjoyed playing the game to pass time and for the most part it’s a very fun game. Started seeing constant unauthorized charges from this app ONLY. Contacted apple, the refunded me a lot of money. Deleted the app, let some time pass and tried it again. Everything seemed fine until about December 2018. If I accidentally hit “continue “ the would cancel it, not finish the purchase it still charged me, a few times it charged me double! Then in January 2019 through yesterday I suddenly had approximately $40 in Toon Blast purchases! No one has access to my phone & I know I did not make these purchases! Apple refused any refunds to me claiming that the iPhone X is so secure it is impossible for someone to purchase or breech the phone. Nothing in this world is 100% safe nowadays. Also why did they refund before, I had the same phone all along. That all bring said, beware if you play and check for charges often! I have deleted and will not ever, never play again! I used to enjoy this game a lot until the powers that be took away gold coin rewards at the completion of each level. 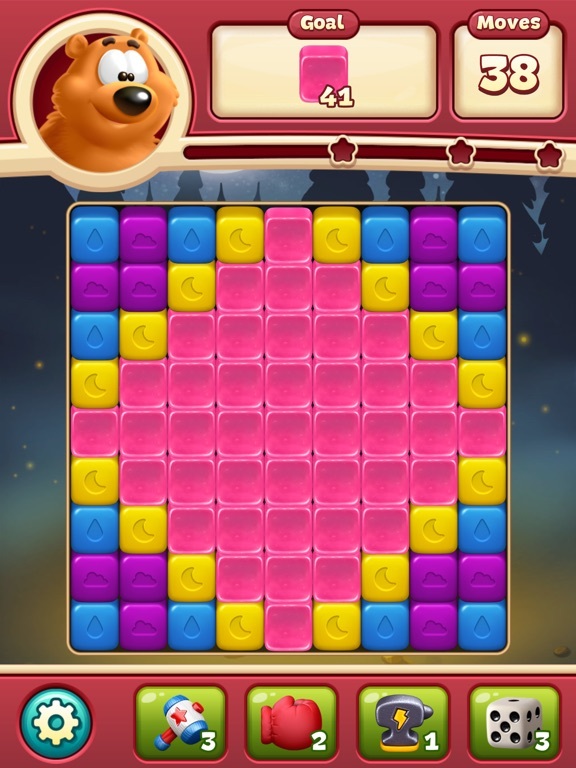 After level 1000 it is quite difficult to complete levels in the number of moves allotted. So saving up gold coins is crucial and it generally takes many hours of play to save even 100 up to buy 5 extra moves. But that isn’t the worst part. After you run out of moves a button appears that says Play On. If you mistakenly hit it it doesn’t ask for authorization or Are you sure? it just automatically takes your precious 100 coins. Even though I’ve played this game for a while I still press Play On by accident thinking I am hitting Play Again. It should with ask Are you sure? or have a split button saying Play On or End Game. It seems the makers of the game want you to hit it by accident to have you waste your coins so you feel inclined to purchase more with real money. Kind of a sucky way to treat your most dedicated players. 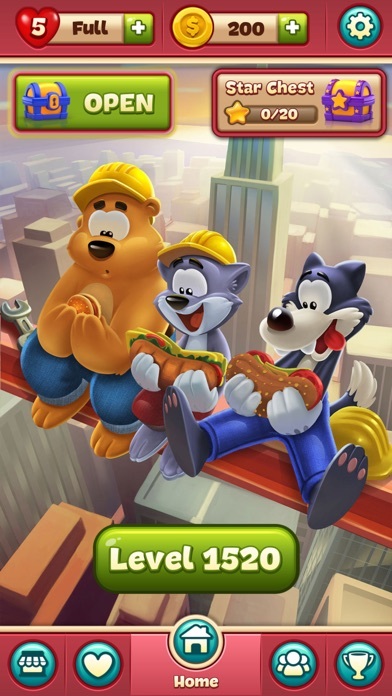 For toon blast, the first ad I saw, it was kinda cute. Three days later, I found out I watched the same ad about 33 times! Seriously, you need to take a break! And when I finally gave in to play this game, I was not satisfied. First, it was like a mind of a 6 year old! Second, after every time I play that game, an ad pops up! Third, it kind of creeps me out. Just the thought of a teddy bear smiling at you just gives me the chills. I’m not telling them to turn the game around to a horror show, I’m just saying that they need to make it kind of a 8 or 10 year old kind of game. Think about it, how many 6 year olds have a phone? Probably like only 5,000 after they all dropped their phones or had a temper tantrum! Other than that, I can say the game is pretty great! Also Apachekid777, if you are reading this, that’s the thing with free games. Every free game has some kind of scam to it. The developers have to make money somehow! It’s just all about how wise you are about spending it. For example, I limit myself to $3.00 every month for only one game to make sure I don’t waste all my money. I’ve actually never done a review, but I decided to do one because I am so addicted to this game. I get bored of games sooo easily, but I LOVE LOVE LOVE this game. I just think it is so fun. However, I have a few suggestions to improve the game. I wish they made it so where you can restart the game over to level 1. I literally have this game downloaded on my phone, my husbands phone, AND my iPad because I can’t get enough of it; essentially, it would just be easier if I could restart the game and so much more convenient. Another suggestion would be to make the lives similar to toy blast.. make it so you can play for two hours straight or however long instead of just five lives, because I get on some levels and can not pass them so it takes me forever and a day to finally pass a level. But my overall review is that it is an amazing game and I just love it. Liked this game a lot at first but after you get well into the 300 levels it starts to get really frustrating. The rewards given are very little. Seems like they calibrate them so well that challenging turns into frustrating and for me when a game is a lot of frustration time to delete it. 100 coins to play 5 more moves and if you pay for the coins that’s about a dollar. Don't get it after all it will cost you 200 coins to go for another 5. Install if you want to but if you are looking to play a game without paying much real money this is probably not for you or be prepared to play the same level over and over. The is no ad watch instead of in game currency and you can get extra guys free but only 5 every 4 hours IF you are in a group that has several active players. My group hasn’t been bad but out of 50 people only 5-10 play and that means you have to wait for those people to select help to give you a life after you request them. Ok: well since I’ve only commented when I feel cheated in a game > WOF! I decided to leave a good review. I downloaded this game thinking it was probably a bit kiddie lol boy was ah wrong! Yes it gets challenging & I’ve been to the Toon town ATM (ap store) quite a bit, but I must say there are some good incentives. What gamers may not realize is that it takes a team effort to when the coin! Maybe you should try joining a better team. My team rocks! Well with the exception of a few coat tail riders. My only complaint is -you play ONE time during the team tournament & collect a few stars & reap the benefits off the hard-work of others (& most likely $$): you should have a little invested in order to win these chest/team tournaments. So anyhoo try joining a new team & one other thing; I think those who play & dont “help” are selfish! Its a team effort & costs you absolutely nothing to help out team mates. Actually you get a few coins! Okay, so I’m here to talk about your ads. Listen your ads make me not want to get the game. All that happens in them is a finger clicks some blocks and then a sphere and everything goes boom. This makes me not want to get the game as it makes it seem way to easy and boring. 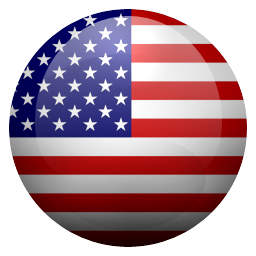 Incorporate more fireworks and bombs into them as well and then it wouldn’t be to bad to see the mega sphere thing. Also I saw in one of your ads you showed a stage hazard thing. LEAVES. That’s actually cool and I was thinking about actually downloading the game until you used the mega sphere and instantly killed the leaves showing it to be much to easy. Now I assume you game actually isn’t all to easy so it needs to be like that in your ads. This game just came off as easy and boring and normally with that comes a lot of in app purchases you practically need to make to win so that’s what I saw by your ads. Change them and I might actually consider playing more than just the first 3 levels of your game instead of practically just downloading it to write a review about how bad you ads are. I don’t believe in spending money on games. This one is manageable without shelling out real money, but it does take persistence. It is far more addictive than one might expect. I know people who prefer to spend real money to advance. I just take a break and come back later. The best part is team competitions... and a way to “chat” with your team. Winning a team competition provides more boosts and coins, soit is easier to progress. I am grateful that the developers got rid of an annoying “piggy bank” that was to induce spending real $— I would have quit if that had continued. (Take note of the date for very low scores on reviews; if they are old they are way out of date.) my only complaint is that the game is way too fun (including challenging) and I spend too much time on it. I don’t know for sure if it’s possible to go below one star so I’ll put one star just to be safe. This is maybe the worst game I’ve ever seen in my life. 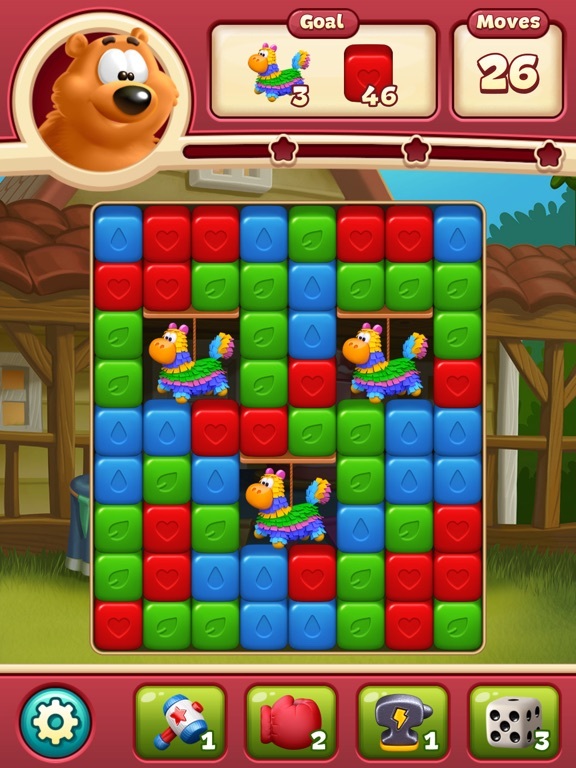 It unsuccessfully tries to copy any other basic “puzzle” game like candy crush but replaces the actual content of the original game with random clicking on colorful squares. 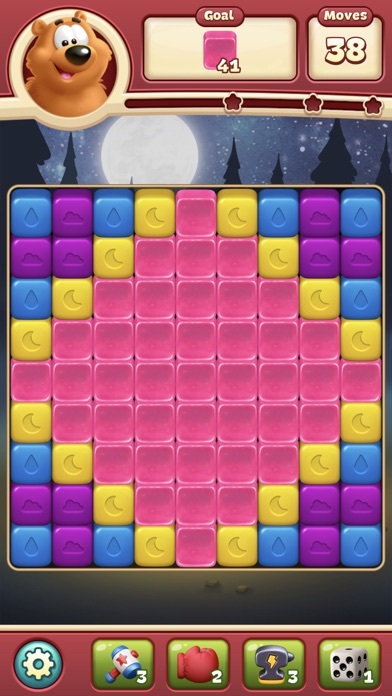 I am so sick of these ads I get ptsd every time I see that stupid bear or that creepy finger randomly “blasting” those matching colored squares. Theres no point to this game either you play one of them then the next will be the exact same or maybe the shape of the area is different, or a blockade will cause some trouble, but it doesn’t matter because you are still doing the exact same thing over and over. You also are expected to pay for some things, who would ever pay real money on something like this, it makes me sick to think that way there might be people out there who have nothing better to spend their money on than an extra bomb in this god awful app. Thank you I would not recommend. Used to love this game, even as it was getting more and more difficult, obviously geared to get players to spend actual cash. I get it. Free game offering, but have to find a way to make it profitable. What I don’t like is that the levels are now getting near impossible to pass. I just saw the age rating for this game, 4+. Are you kidding me? I don’t know of any 4 year old with the patience to figure out some of these levels. If the developers mixed in more levels that were easier to pass, I would enjoy this game again. But I find myself more and more ready to just quit. It’s getting to be more irritation than it’s worth. Especially when I see things like a “global” and rocket combo that literally misses EVERYTHING you need it to hit. Seriously. Didn’t hit one target out of 20 rockets. It’s happened more than once and has made me step away from the game for days. Slow close to just quitting. The game is fun and addicting. The lower levels are a good mixture of luck and strategy, but the higher levels become almost all luck; the playing field (where there are blocks) is so small that you typically have only one or two possible moves, so there's no strategy, you either get the blocks you need or you lose. Lowering my rating to one star. I got so frustrated at the higher levels where it's clear that the game has tuned the probabilities to make combinations extremely rare at the beginning but more common near the end as a crass way to get you to spend stars — and hence money — to get the few additional moves you need to win. The one star rating is for this: I finally got so frustrated that I just wanted to go back to the beginning when the game was actually fun. I deleted and reinstalled only to find out that it unconditionally restored my game! How dare you developers presume to tell me I can't start over, how DARE you!!! You should be very ashamed of yourselves. This is the first game I ever installed after seeing ads for it in a card game. So first game of this type. I am older and not used to playing this type of game. At first it was fun to move up levels try strategies to get past them, etc. Then the levels got harder and harder and I would get stuck on one for weeks, this is no longer fun but frustrating. It is making me anxious. After being stuck in a level in the high 100s for weeks ,I beat it by using all of my boosters I had saved, and will delete it. I am playing other games that at least strategy and persistence pay off, I do not ever expect to win the first time I play any game. Two stars for being fun until the levels get very hard to beat and seem stacked against you. If you are doing this to keep your mind sharper as you age, which I was, but find strategy does not help at all and it all seems like chance, then you might as well play something else. You will become addicted without even realizing it! I love this game! It’s so easy to beat the levels and I only play for about 30 minutes total per day. I initially played maybe 2-3 times per week for like 15 minutes per day. Then, I joined a team that was serious about helps and the team score, and the next thing I know, I’m opening the game every lunch break just to send help/lives (I play at night to detox). The lives really come in handy, and my team always wins the tournaments and team chests so I’ve never had to buy the booster packages. (I’m in Champions League btw, which is the highest level for the game until the developers create new ones.) Moral of the story: Join a good team, and you’ll fall in love with the game and maybe meet a few decent people along the way. I’ve been playing this game for a few months and am on level 1140 or so. It’s a great game, but recently they stopped giving you coins whenever you complete a level. One of the good aspects of this game is it’s not pay to play. I’ve made three $13 purchases just because I felt the developers should be compensated for their hard work, not because I had to. The problem is that now that the game no longer gives you a few coins with each level, it’s much more of a pay to play because some levels are designed to require those extra five moves. If I get to the point where I have to start making purchases I’ll quit playing. I don’t know if you guys are hurting for $$, but stop trying to fix what ain’t broke. First I loved the game. But it’s set up to make you like it enough to want to play. You have teams, etc. On some levels you cannot get a break and nothing you do will help you. You risk getting an arrow you need but it’s turned in a way that won’t help and you lose that. I bought a few things and suddenly it’s just charging the **** out of my card. Apple fixed it and I decided to keep it. It did it again. I sent a message and was given a crazy answer. 1.99 or 4.99 will never me $25. It’s random and it bills you when it wants. Please refund money and offer the game to be bought or something with one time fee. This is interesting enough to play but I’m about to switch games. It’s just not worth the times and effort when strategy is overtaken by luck of the draw so to speak. No skill necessary. Just luck. And you usually run out right when you’re at the last move after playing the same level for two days.